Matt Brown and Happenstance. Photo by Liz Hall. 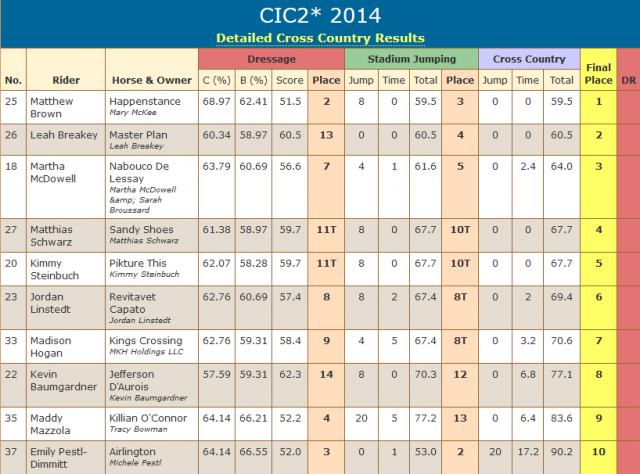 The leaderboard shuffled in the CIC2* at Galway Downs today after cross country. A few issues popped up on a course that looked to ride well throughout the day, according to the leaderboard. 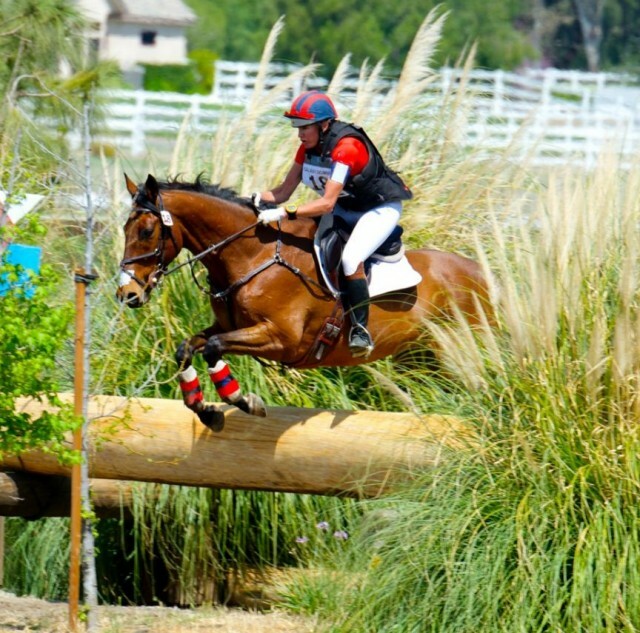 Fence 17 caused the most problems, with four riders picking up stops. 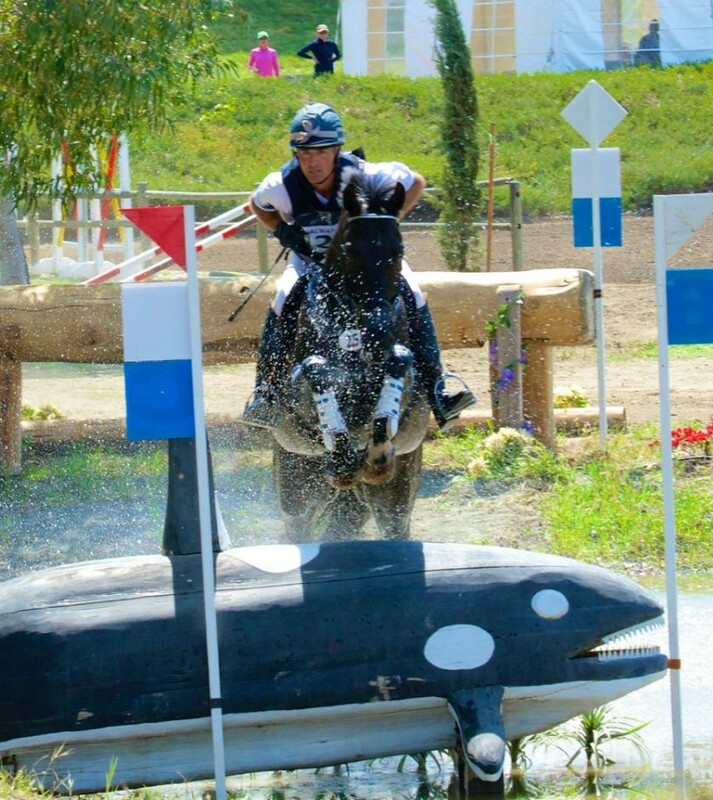 Overnight leaders James Atkinson and Man on a Mission II picked up 60 penalties at fence 17 and dropped down to 13th. Leah Breakey and Master Plan. Photo by Liz Hall. Leah Breakey and Master Plan jumped up the board from 13th after dressage to second overall, finishing on their dressage score of 60.5. It is also worth mentioning that Leah was one of just two double clear rounds in a tough show jumping yesterday. Martha McDowell and Nabouco De Lessay. Photo by Liz Hall. Coming in third are Martha McDowell and Nabouco De Lessay, who formerly competed at the three-star level with Jennifer Wooten. Martha took over the ride in 2012, and this weekend’s finish is the horse’s third top-3 finish in as many starts. This pair came home with just 2.4 time penalties today to move up from fifth overnight to third overall. Jordan Linstedt, who jumped clear with 2 time penalties to move up from eighth to sixth on RevitaVet Capato, was thrilled with how the course rode, and felt it was a great start for Capato. “The course was fantastic! It flowed extremely well with very open gallops, but had plenty of questions to test the horses’ rideability and adjustability. It was one of my better runs and a great first two star for the year,” Jordan said. 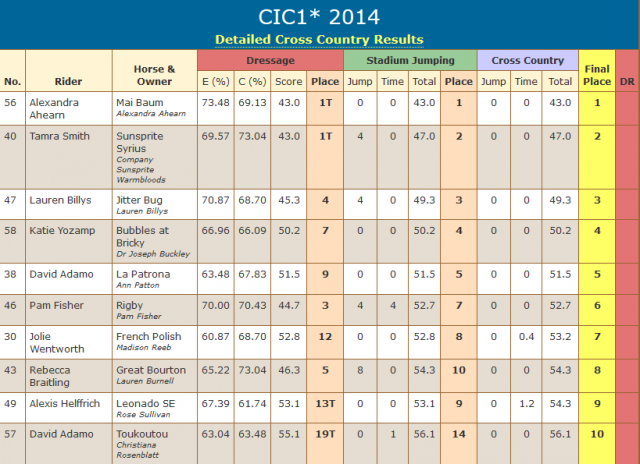 In the CIC*, Alexandra Ahearn and Mia Baum led from start to finish (although they did tie with Tamie Smith and Sunsprite Syrius after dressage) to win after going double clear on cross country. The CIC* course looked like it rode extremely well for the competitors today, and about half of the riders finished double clear. A few riders picked up 20 penalties on course, but it appears that the course rode smoothly overall. 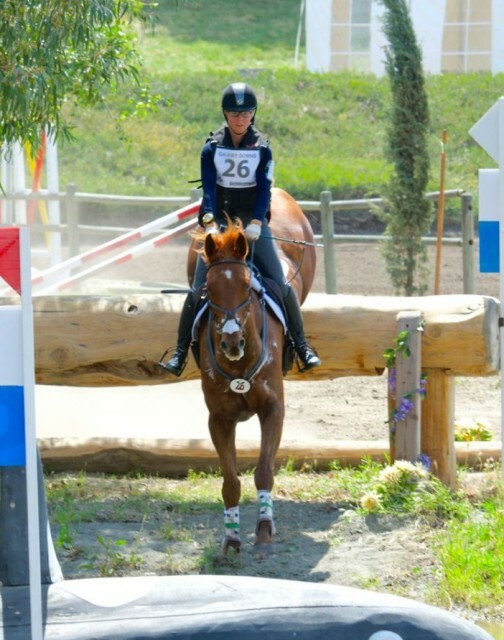 Alexandra, 18, will be thrilled to pick up her first one-star win with Mia Baum, a 7-year-old German Sport Horse. Lauren Billys and Jitterbug also went double clear today to pick up third place, adding just a rail to their dressage score to finish on a 49.3. Many, many thanks are in order to Liz Hall and Mallory Thompson, who have graciously sent me some the photos and videos in this post. As always, if you have any photos, videos, or general updates you’d like to share, you can send them to us at [email protected], share them on our Facebook wall or tweet them to @eventingnation. The chinchillas thank you in advance! Jordan Linstedt and RevitaVet Capato. Video courtesy of Mallory Thompson. Tamie Smith and Twizted Sister. Video courtesy of Mallory Thompson.